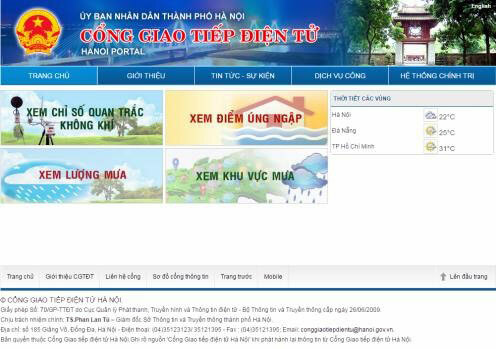 The Hanoi People’s Committee on January 9 launched an online service with information about weather conditions and environment indexes, including air quality index, rainfall and flooding. The page, hanoi.gov.vn/quantracmoitruong, is part of the committee’s efforts to turn the capital into a greener, smarter and friendlier city. It is also aimed at helping residents and tourists plan activities, and raising public awareness of environmental protection. The city has built ten air monitoring stations, two of which will provide updated air quality data, and the other eight will serve the study, management and modelisation of air quality. The city also set up a rainfall measuring system and data transferring system at 22 locations across the city. Air quality and rainfall data provided by the city’s relevant agencies, including the environment department and Water Drainage Ltd Company, will be available on the newly-launched page. The city plans to provide other environment observation indexes, like the quality of surface water in lakes, waste water and underground water. The US embassy in Hanoi also measures air quality on an ongoing basis and provides the data on its web site./.